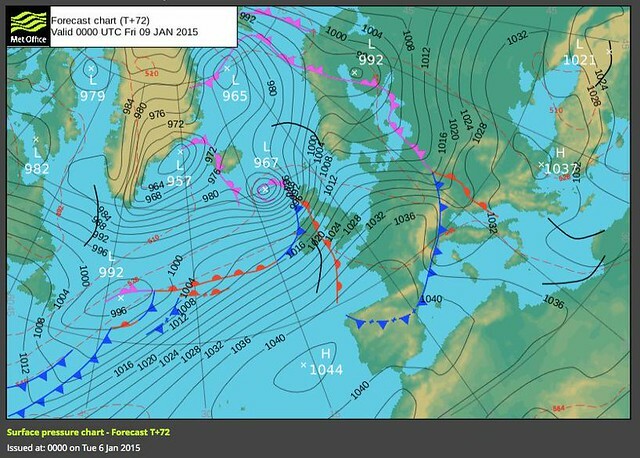 Another very vigorous depression is likely to run quickly eastwards, passing to the north of Scotland on Saturday. This is expected to bring very strong westerly winds to many northern and central parts of the UK on Saturday. Gusts of 60-70 mph are likely quite widely. The winds should gradually ease from the west later in the day. The public should be aware that that disruption to transport and possibly power supplies could occur. Another very vigorous depression is likely to run quickly eastward, passing to the north of Scotland on Saturday. This is expected to bring very strong westerly winds to northern Scotland. Gusts to 70 mph are likely, while gusts of 90 mph or more are possible in exposed areas. The public should be aware of the risk of disruption to both transport and power supplies, as well as the risk of some structural damage. Large waves may lead to dangerous conditions along some coasts, while lightning seems likely to become an additional hazard during the day. The winds should gradually ease from the west later in the day. Much the same right across to the East Coast.